Apple Shows Off Larger iPhone 6; Unveils New Apple Watch : The Two-Way After months of rumors and dozens of fan-created images of what an Apple watch might look like, the tech giant shows us what it's been working on today. 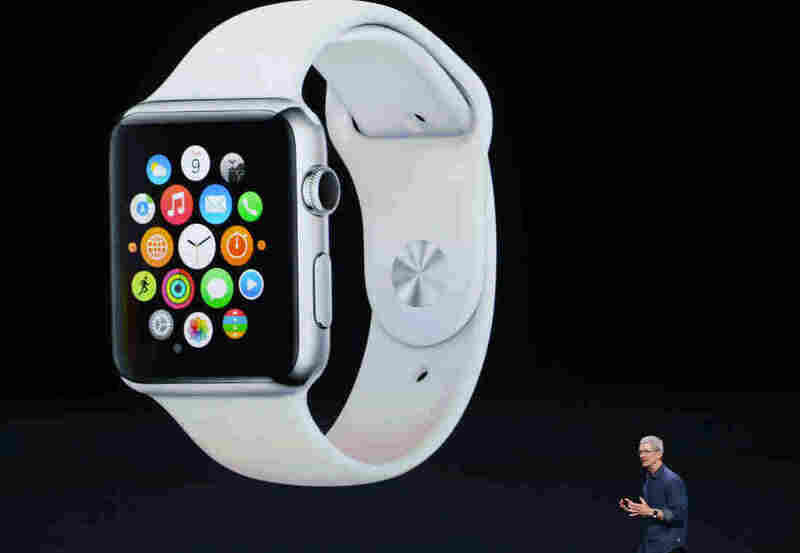 Apple CEO Tim Cook announces the Apple Watch Tuesday in Cupertino, Calif. Apple unveiled the long-awaited smart watch, which comes in two sizes and requires an iPhone. We'll be updating this post with news from Apple today, including tweets from NPR's Laura Sydell, who's at the event at the Flint Center. The new smart watch "starts at only $349, and it will be available early next year," Cook says. Apple Watch will be compatible with iPhone 5 models in addition to the new iPhone 6, Cook says. The event is now wrapping up, with Cook summarizing. As a final note, he adds that Apple Pay, the touchless payment system introduced earlier, will work with the Apple Watch. Then he introduces the band U2. The new smart watch comes in two sizes, both of them with rounded edges. There is also a range of colors for both straps and the watch's body, to let people customize to their own style, Apple says. One version has a case that's 18-karat gold. The sports edition is made of aluminum. "We have been working on Apple Watch for a long time," CEO Tim Cook says, noting that it incorporates many different functions. He touts the device's ability to help its owners be active and track workouts. The user interface is based on finger-swipes and a side knob that evokes the old winding knob. #AppleLive Jonny Ive narrates video. Digital crown is what they r calling the wind button. it is home button, scroll button. Apple says its iPhone is "required" to use the new watch. It's unclear precisely what that means, for now. It has built Siri, the voice and audio interface, into the watch. And the watch allows its users to send each other "taps" and visual messages. CEO Tim Cook says the next product unveiled will "redefine what people expect from its category." He introduces the company's new Apple Watch, which has a square-ish body and rounded edges that are similar to those on the new iPhone. The name is not, as previously rumored, the iWatch. #AppleLive says a lot of ways to customize how it looks. works seamlessly with iPhone. comprehensive health and fitness device. Saying "We've created an entirely new payment process," Tim Cook introduces Apple Pay, a system that allows a customer to use an iPhone 6 to pay for items at stores. The transaction uses the Touch ID (which requires a fingerprint) and near-field communication — NFC — to interact with card readers. #applelive Schiller believes that iPhone is now the most popular video camera. 240 frames as second on the new phone. CEO Tim Cook and Marketing SVP Phil Schiller discuss the technical improvements to the new iPhone 6, which has improved slo-mo ability. #applelive now to iOS 8....will go back to be used to 4s and u can download on Sept. 17. The new OS will include an app for sending short voice messages. Price for the iPhone 6 Plus will start at $299. The new phones will come in gold, silver and space gray. 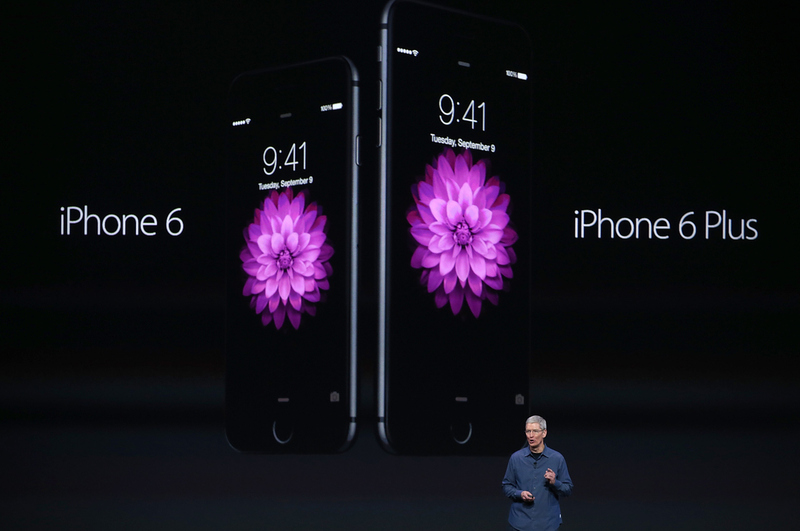 Apple CEO Tim Cook announces the iPhone 6 and iPhone 6 Plus at the Flint Center in Cupertino, Calif., Tuesday. The phones' diagonal screen sizes are 4.7 inches and 5.5 inches, respectively. After frustrating many users with a balky live feed that stopped and started — and included real-time Chinese translation — Apple's streaming video of Tim Cook's keynote address has been mostly restored. The live video is available only on Apple software, we'll note — meaning that many people are monitoring the event through live blogs. Some problems persist, it seems. Apple CEO Tim Cook, promising "the biggest advancement in the history of iPhone," introduces the new iPhone 6 and the iPhone 6 Plus. The diagonal screen sizes are 4.7 inches and 5.5 inches, respectively. They are each thinner than the iPhone 5, and feature smoothly rounded edges. #applelive Tim Cook is on the stage...to wild applause from the chosen audience. The release of what many are calling the iWatch has been anticipated for months; today, reports are emerging that the watch will include a health-monitoring app the company developed with the Mayo Clinic. Many expect Apple will also set release dates for new iterations of its iPhone and operating system, which could allow people to use their phone as a wallet, in place of credit or debit cards. Analysts predict that CEO Tim Cook will demonstrate the iPhone 6, with a new design and larger screen, which could hit the market later this month. As NPR's Laura Sydell says, the new model responds to a push to make phone screens larger: "The iPhone 5 screen is 4 inches on the diagonal compared with 5.7 inches on the [Samsung] Galaxy." Many have looked to Apple's unveiling of a smart watch as a potential "disruptive" product, one that can create new demands and expectations among consumers and shape a new market. The market for smart watches has long been seen as one that's waiting in the wings, ready for explosive new growth. But tech experts say the trick will be to differentiate the watches from smartphones — and to give consumers a reason to buy yet another device. Other companies have already unveiled capable and stylish smart watches, most of them using versions of the Android operating system. Motorola recently released its Moto 360, a $249 watch with a traditional round body and wrist strap — but with a screen that can morph from a digital or analog watch face to one that shows emails and messages. And the Pebble, a blocky watch whose style evokes 8-bit graphics, made headlines for being what Wired called "the most successful Kickstarter project ever," raising $10 million back in 2012. The company is now selling its watches online for $150-$250. As NPR's Steve Henn reported last year, Samsung's Galaxy Gear watch sparked a mixed reaction when it was unveiled, largely over its price ($199-$299) and short battery life. "What really excites technologists like Feld about watches is how intimate these devices could be. A watch touches your skin, so it can take your pulse, measure your temperature and record the quality of your sleep. Feld says it could become almost like another organ." In addition to Samsung, Steve also mentioned the Fitbit, a flexible wristband that collects "personal metrics" about its wearer's movements and health. The device has proven to be very popular — but it lacks the range of consumer-friendly features that a smart watch can promise, and it relies on connections to a computer or smartphone. The Fitbit brings us to the wider realm of smart nonphones that many simply call wearables. Google Glass can fit in this category, as well. The pursuit of a smart watch that's both attractive and useful — and a hit with consumers — is one that's been running for years. Tech giant Intel made its attempt back in the 1970s, for instance, with the doomed Microma watch. Among Apple fans, anticipation has been building over the company's possible release of a smart watch Tuesday. 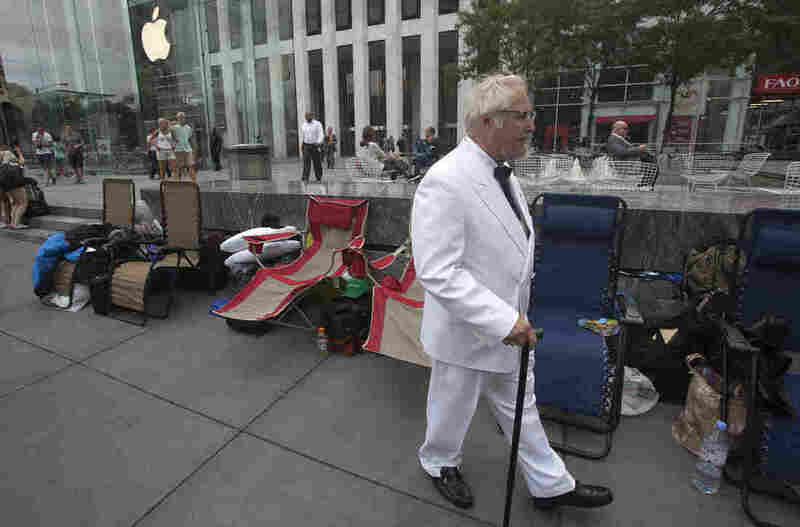 In Manhattan, a man dressed as Colonel Sanders was among those who gathered at an Apple Store ahead of today's event.